FundFive has developed strategic consulting offerings designed to place your institution on a path towards success. We know higher education. Together, our founders have spent nearly three decades in higher education as leaders on college campuses, enacting change and governing growth through sound business strategies and well-executed entrepreneurial practices. By employing ClarityTM in your institution, you immediately have executive level decision making capabilities for less than you would pay an entry level position. As colleges and universities struggle to navigate the waters of unsettling economic times, FundFive offers an elegant solution for helping to budgeting simpler. Every campus strives to regain financial abundance as it seeks to attract the best and brightest minds to become a part of its community. At FundFive, we believe that ensuring student success begins with securing the resources to make the path to achievement accessible to all students. Solidify the Middle in response to today's higher educational landscape and navigate your institution toward prosperity and greatness. Technology is the language of business. Our mission is to help other campuses realize the power behind our approach to higher education administration. FundFive offers custom engagements on a variety of topics based on experience, each of which are designed for you and your team to Be Ready for Monday. About Our Development Partner Program Launched in 2016, our Development Partner Program has been comprised of a few beta institutions (representing private and public four year institutions and community colleges). This program has provided an opportunity for campus teams to influence new features and have direct input on the development road map of multiple software offerings. As new features are built, Development Partners are the first to receive them! Contact us today if you are interested in becoming a member of our Development Partner Program! Facing a new academic year with legacy budgeting practices, Johnston Community College determined that the campus needed to improve its business processes and become more efficient. Enter FundFive. Budgeting for an institution is a complex and increasingly pressing challenge. Responsibilities for managing funds on a weekly basis are often distributed across an institution, from academic officers to enrollment managers to athletic staff. As budget managers represent various factions of the business, requests can come with competing needs and interests. Such practices can result in leadership being left out of the decisions at a granular level. Johnston Community College, a midsized community college in Smithfield, North Carolina, understands the importance for transparency and fiscal responsibility. As a growing community college, the decision to implement ClarityTM signals a shift towards improving the budgeting culture and informing the business office about all financial decisions across the institution. To read the entire case study, contact us and we'll send you a copy! We have been working with colleges and universities for nearly two decades, and during that time, we have met thousands of great people who champion excellent ideas about how to better the business of their institutions. Often, however, these same individuals lack the necessary tools to bring their ideas to fruition and enact change. 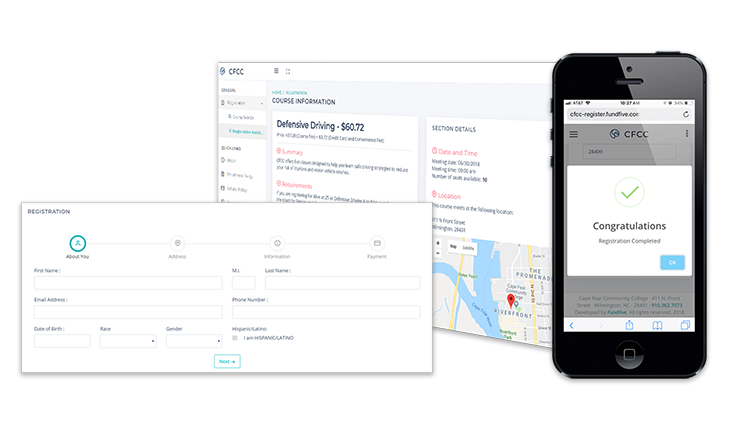 When we first imagined FundFive, we set out to grow a business with one goal in mind: to bring easy-to-use tools to Higher Education teams at an affordable price, As costs continue to rise, it’s our mission to help each campus deliver better service to the campus community with elegant solutions that just work. FundFive delivers ClarityTM, an easy to use, web-based tool for perfect budgeting across the organization. Introspection. Instant analysis. Turn on a dime decision making as campus demands change. By employing ClarityTM in your institution, you immediately have executive level decision making capabilities for less than you would pay an entry level position. Continuing Education enrollment can rise and fall with the local economic outlook, and so prospective students often turn to a local community college to build new skills or refresh others. RegisterTM enables institutions to deliver an unrivaled student enrollment experience, providing a painless registration experience and reducing burden on support staff. By integrating information gathered from prospective students during the registration process (or directly imported from Colleague), admissions marketing and public relations teams can create digital campaigns to expand the use of traditional communications management. EngageTM provides greater transparency into simultaneous campus comunications, eliminating silos and placing individuals at the heart of an institution's communication strategy. Every college student graduates with a transcript in hand, but how many actually keep a record of all of their extracurriculars and additional achievements over the course of their attendance? With RiseTM, institutions can promote activities and students maintain a record of their accomplishments in a streamlined mobile application, earning badges predetermined by the school. By building a co-curricular transcript, students graduate with a holistic record of their time on (and off) campus. We are constantly looking for ways to improve the experience of the end user through better technology. If during your workday you find yourself struggling through what should be an easy process and think, “I wish there was a better way to do this,” please give us a call. We are happy to explore custom solutions with you and your team. We’re always available for a conversation! While off-the-shelf ERP and SIS systems offer financial solutions within their product suites, the tools are seen by many to be extremely expensive, antiquated and difficult to administer at an enterprise level. This results in distributed ownership of the budgeting process and a lack of overall transparency to the current state of an organization’s budget. 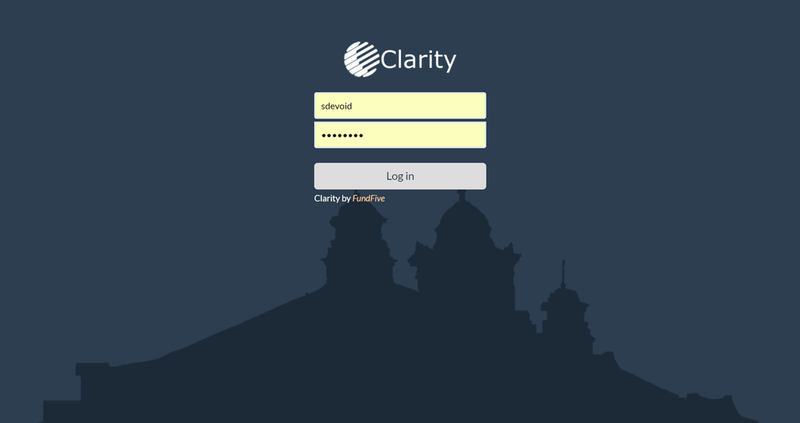 FundFive introduces ClarityTM , an easy to use, web-based tool for perfect budgeting across the organization. Introspection. Instant analysis. Turn on a dime decision making as the world around you changes. Your budget should contribute with information and bring intelligence to your decision making. ClarityTM frees your budget from the confines of spreadsheets and even paper so that it may become alive and tell you what you need to know. What are the goals of your institution? Our chaotic reality does not allow for any time to be wasted. FundFive has created ClarityTM to allow you make these goals possible. With ClarityTM , you can take time out of the equation. ClarityTM will allow you to make decisions on the go. ClarityTM is designed with your budget in mind. Budgeting for an institution can be compared to running a large business in the private sector. Each has multiple sources of income and many types of expenses associated with the operation of its business. Thankfully, we've developed ClarityTM with your budget in mind! Your budget should contribute with information and bring intelligence to your decision making. By employing Clarity in your business, you immediately have executive level decision making capabilities for less than you would pay an entry level position. Clarity frees your budget from the confines of spreadsheets and even paper so that it may become alive and tell you what you need to know. As the individual in your department responsible for estimating the annual budget needs, simply edit your budget and submit it for review. As a campus administrator, review the state of finances in a single view. Receive updates on the items that matter most to the institution and take charge of the finances across every area of campus. Clarity TM was written specifically for Higher Education, and it was designed for institutions using Ellucian Colleague. Please complete the contact submission below, and be sure to select which demonstration you are interested in attending. A representative will contact you to confirm registration. Thank you for expressing interest in Clarity! We look forward to showcasing its functionality and engaging with your institution! At the beginning of the week when the rubber hits the pavement, it all comes down to the road map that you set for your institution and the means for traveling that path towards making it a reality. FundFive has created Be Ready for Monday to keep ahead of the obstacles that can keep from making your goals possible. This is the team that you need working with your institution. Contact us today to learn more about our offerings. Sign up with your email address to receive news and updates each Thursday afternoon to help you prepare for next week. Be ready for Monday. FundFive respects your privacy and will not share your contact information without your consent. Thank you for your interest in FundFive. Why wait until the start of a new work week to enact change? Be Ready for Monday is a tested and proven approach for helping executives form a strategy for balancing business objectives with other weekend priorities. By working together, let FundFive help you to form knowledge and practices that can be turned into action upon return to the office. Below is a sample of articles written as part of the Be Ready for Monday series. What was once considered an institution's brand is now less about the look and feel of a logo, the presentation of a publication, or even the main website, and more about the communications shared and the experiences one has when interacting with members of the campus community. What is an institution to do when negative press hits right in the middle of a hot admissions cycle? The answer to this problem is not a simple one, however there is one basic step that you can take to influence how much of a drop you will see related to incoming (and retained) headcount: Flood the wire with positive media releases immediately and constantly. As a team we rely on the strengths of the group, but as individuals we must accept the boundaries of our personality and experience. We should never try to be who we aren’t, because success comes when the world responds to how authentic we are. While authentic attitudes generate successful brands, quite often manufactured brands only generate empty disinterest. As you increase your cost to your clients, what are you providing in return? Many institutions will explain cost hikes as necessary for the maintenance of the structure they already have, stating everything gets more expensive every year. However, the mentality of looking for explanations to justify value is the start of a downward trend. Bob says, "You can please some people some time, but you can’t please all the people all the time." So, then what is the best way to go about working with individuals that offer little to the conversation but demand the moon? Higher education should strive to do whatever it takes to be "easy to do business with." We need to be better at understanding and responding to students' expectations and encourage problem solving on the front lines. As leaders in higher education, we have an opportunity to create meaningful cultures that encourage our teams to own the students' experience. With every challenge that we face as professionals comes an opportunity for each of us to deliver improved, measurable results and exceed expectations. Seek out pristine points of reference in your professional and life experiences. Value does not exist by itself; value exists in the connections made between things. As a growing software and services company, we believe value requires interpretation. Sometimes the value doesn't come in the form of a delivered solution, but rather later, when one creates a report or illustrates with data the impact that a solution has had on an operation (and perhaps on its bottom line). Data must always be presented with a story in mind. Data without a story is nothing but a confusing bag of numbers. For example, if you were presented with a number, say, 25,338.84, would that figure have any meaning to you? Of course not, as it is without context. However, if one was to say that the figure represents the closing market value of the DOW Jones Industrial Average yesterday, then it's a number worth noting. What specific metrics are important to follow in college reporting? Out of all metrics with which we have worked, there is one common thread that makes all other variables clearer: Cohort comparatives. One can look at data all day long and find very little meaning, but once cohort comparatives are inserted, the data will come alive. With a completed disaster recover planning document in hand, the time has arrived to present the information gathered to the entire executive cabinet of your institution. Just as you have no choice but to provide them with service, they have no choice but to care. They need to understand the state of the technology in the business. When it comes to disaster recovery planning and the circulation of information, we believe it is best absorbed when presented consistently and repeatedly. So, once you have created the plan for restoring systems in the event of failure, remember to use a familiar format. Include a paragraph about the purpose of each system, and always re-distribute the same document with relevant updates highlighted. By addressing systems of lesser overall importance first, your team has the opportunity to become comfortable with discussing disaster recovery with stakeholders. This exercise will serve as an easy introduction into how to justify cost and importance externally. Document the cost of redundancy, security, and performance in a suggested list of key metrics. Institutions of Higher Education design web experiences to provide a service. In rare occasions, whenever dealing with new students or retention, schools attempt to gather intelligence about student intent. If institutions are able to understand intent, admissions staff can engage a potential student in a way that inspires them to achieve that which they want, generating a win-win relationship that will hopefully last a lifetime. Not all solutions are fixed price, and time and materials costs can impact the decision to green light a project or table it for a later time. Changes to scope or additional requirements can result in a change request and cost overruns. Those costs can make or break a project. Three critical factors can weigh heavily on the overall success of your next project. The very nature of a summer on campus fosters the notion that, without plans, we might be left to our devices and to whatever direction our peers might take us. Without thoughtful planning and sound execution, we may be in for one crazy summer. Compliance is a requirement, not an achievement. Those who base the measure of their success on reporting how well they comply with the rules of the business (or the rules imposed onto the business) are the same persons who believe stopping you from moving forward is part of their responsibility. That mindset needs to change. The best way to enact your strategy is to get everyone else to support it (which contrary to popular believe is not an obvious strategy). Yet, few of us do it. The successful leaders we know understand that it has nothing to do with plowing through people and challenges, but everything to do with approaching the conversation with confidence while convincing others to join you. The concept that System A integrates with System B (new or existing) requires much more internal coordination than simply tying interfaces together logically. Even if one system can generate the necessary data elements and a second system consume the data, how does one make the determination that the two systems are "integrated?" Colleges are hard to maneuver, and the internal processes that may seem obvious and logical to those involved with their designs often end up abandoned for reasons beyond anyone’s control. By paying close attention to the processes and the impact that each has on your students, you can save your institution from missing bigger opportunities. Campus leadership often asks, how do we encourage more students to complete a set of measurable tasks? With the rise of mobile devices in the hands of its students in recent years, that answer has been to make it into a game! Gamification has risen in popularity in education today because of its perceived viral appeal, but it has an archenemy. In a complex business such as an institution of Higher Education, we depend of each other's function the same way businesses vitally depend on each other. The difference is that instead of causing the closing of a business, internal restrictive policies cause deep inefficiencies in the functions of the college. You can't control external factors that affect your budget. But you can create a plan to consider those factors. Strategic planning and budgeting may start with the unknown, but it immediately becomes an exercise in understanding how all functions of an institution are ultimately tied to headcount, funding source(s), and long terms goals. Can Infrastructure Be Financially Strategic? There are three reasons why some CIOs find themselves in a similar position, because like it or not, they are still required to live with a data center operation daily. However, maintaining the facility constitutes a waste of strategic time that might otherwise be better spent on the software and services layers of the operation.